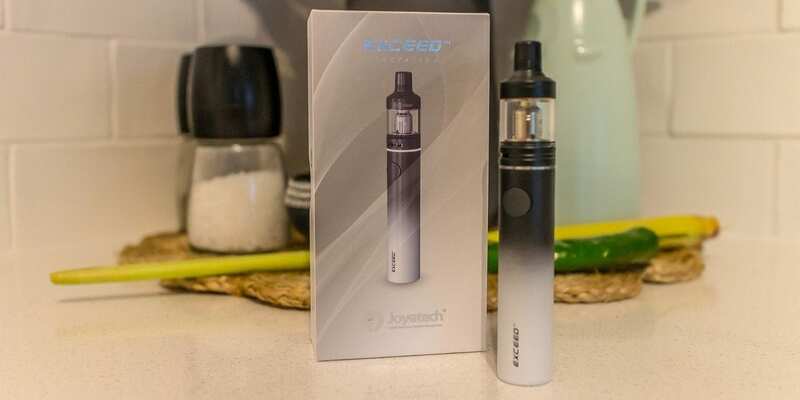 Joyetech Exceed D19 Starter Kit Review | Excellent for the Beginner - Daily Vaping Deals & The Best Vape Product Reviews at Vaping Cheap! 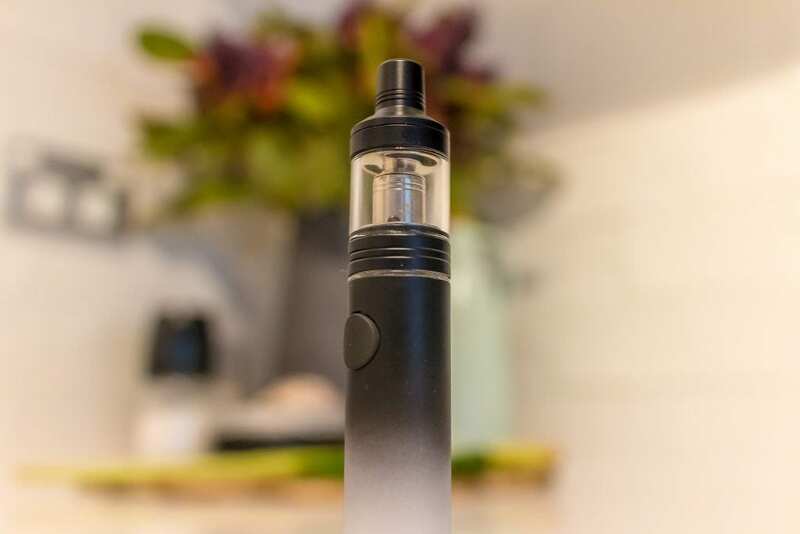 The Joyetech Exceed D19 Starter Kit is a 19mm tank and battery kit, that contains everything you need to get up and running, sans your favorite e-liquid. The Exceed D19 atomizer is a 19mm tank, is 2ml in capacity and can be removed from the mod. It can be dissembled for cleaning and changing coils and it comes with two coils as part of the kit. The Exceed D19 battery is in the form of a stick mod. It has a 1500mAh battery that has over-charging, over-current, over-discharging and Short Circuit protection. The finishes available are Silver, Black, White, Dark Orange and Black and White. We’d like to thank Heaven Gifts and VapeSourcing for sending this kit our way for the purposes of this review. Heaven Gifts Coupon Code: ACHEAP15 for 30% Off For Month of October! The packaging on the Joyetech Exceed D19 Starter Kit is in line with all of Joyetech’s designs. A predominately white and grey box with a product picture on the front and the standard specifications on the back. The box opens to reveal the mod and tank on one side with another smaller box containing the spares and USB lead. The usual instructions and warranty information can be found underneath. There is no foam or padding in the box, however this doesn’t matter as the way it is packed will ensure nothing gets damaged in transit. Upon inspection of the kit, it looks really quite good and a small petite package overall. Being 19mm in diameter, the kit is quite small and fits nicely in the hand. There isn’t much weight in the unit, however it feels solid enough to not feel cheap and nasty. The black and white faded finish looks really cool and the black tank on top accentuates the whole kit. 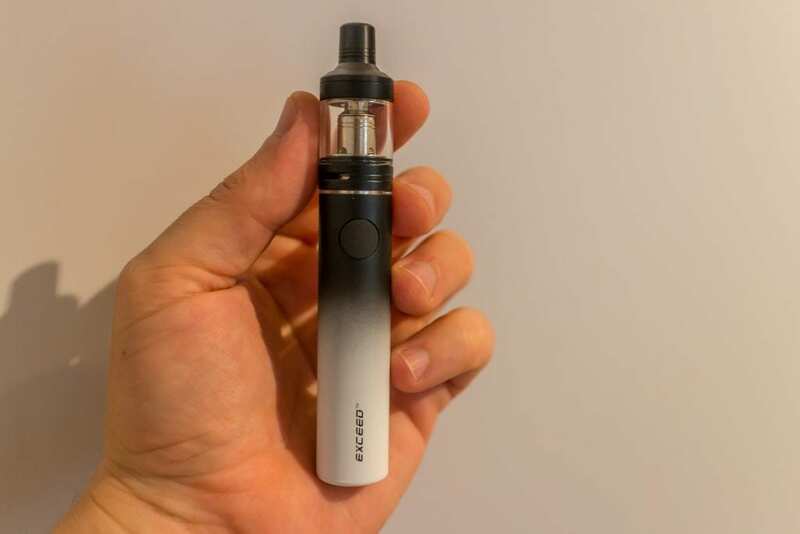 The overall build quality and feel of the mod is premium, which is definite pro for the price point of this kit. One side of the Joyetech Exceed D19 mod has a fire button, which is nice and clicky and doesn’t rattle at all. On the opposite side, there is a micro USB port which is obviously for charging the battery. There is an indicator ring under the tank that lights up to advertise certain functions of the operation of the battery. The tank features a bottom adjustable airflow that looks to cater for DTL and MTL vaping. The drip tip is incorporated into the top cap and is not removable by itself. The top cap unscrews to reveal two kidney shaped fill ports. The Joyetech Exceed D19 Starter Kit comes with one 1.2 Ohm Mouth to Lung coil and one 0.5 Ohm Direct to Lung coil, which are both made from NiCr. There are two modes to operate the mod in, which are Direct Output and Constant Voltage Output. The Joyetech Exceed D19 Starter Kit already comes with one coil pre-installed. However if you need to replace a coil, simply unscrew the base of the tank off and replace the coil by unscrewing it and screwing the new one in. 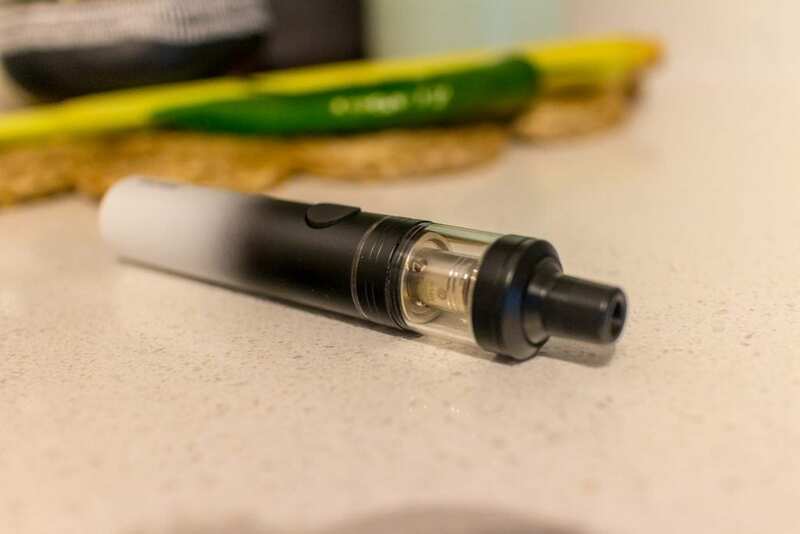 Before filling the tank, it is recommended to prime the coil by placing a few drops of e-juice on the sides where the wick is exposed thru the juice ports. To fill the tank, simply unscrew the top cap off and fill your e-liquid into one or both of the fill ports. The tank holds around 2ml of e-juice which meets TPD requirements. Once full, replace the top cap and get ready to turn on the battery. Five clicks will turn the Joyetech Exceed D19 Starter Kit on and off. To swap modes, you need to have the power off and hold down the button until the indicator lights up. A different color will display for each mode selected. White light is direct output while orange indicates voltage output mode. To charge the mod, simply plug in the micro USB cable. It’s red while charging and will go out once fully charged. How do the two modes differ? In the direct output mode, the battery will fire at the voltage remaining in the battery – much like a mechanical mod does. Note, that the less charge remaining in your battery, the lower the output will be. It will exponentially go down with the voltage dropping. In voltage output mode, the battery will take into consideration the ohm reading of the coil and provide the most efficient setting to match. I have to say that in direct output mode, this setup is not very impressive. Given the small mAh of the battery you will notice the voltage drop quite rapidly. When this happens the vape quality drops off substantially and it does not provide a great vaping experience. In voltage output mode, the Joyetech Exceed D19 Starter Kit performs much better. The 0.5 ohm coil will chew through your battery quickly in either mode, however the MTL 1.2 ohm coil is a lot more conservative. I found this coil to be the best match for using the Joyetech Exceed D19 Starter Kit. The flavor off the Joyetech Exceed D19 Starter Kit is very respectable for such a small unit. It is not going to compete with a sub ohm tank or an RDA/RTA setup, however it is not designed to do so. The airflow backs off really nicely to give nice restricted MTL experience, which is really where this kit is aimed at. For those looking to make the switch to vaping from smoking – I think this would be a really good start. You could begin with the 1.2 ohm coil with a backed off airflow to help mimic the draw and experience of smoking a cigarette. And then once you wanted to start experimenting with sub ohm and more vapor, you could swap to the 0.5 ohm coil and open up the airflow. This would be my recommendation on how to approach the Joyetech Exceed D19 Starter Kit. Don’t expect a huge amount of life from this battery. Given the overall compact size of the package though, you have to be mindful that it is a compromise on battery size and life. It is respectable for such a small unit and it will get you through a good few tanks before having to think about recharging. Obviously the 1.2 ohm coil in constant output mode is going to yield the best battery life from the Joyetech Exceed D19 Starter Kit. I did not experience any leaking or gurgling from the Joyetech Exceed D19 Starter Kit as I was very particular about keeping it upright and not tipping it or storing on its side. I am routinely in a habit of keeping stick style mods vertical to avoid gurgling or leaky atomizers. There was no mis-behavior or unexpected issues encountered while testing this unit. Overall I am impressed with the Joyetech Exceed D19 Starter Kit. It shows great build quality and attention to detail. The satisfaction and vaping experience is really good with solid flavor to boot. The features on board are great for the price point. It really does a good job as a starter kit, checking all the right boxes for someone making the switch. It is nice and compact which is always handy and for someone who is used to only carrying a packet of smokes and a lighter – which is important. Throwing a box mod, batteries, a sub ohm tank and a bottle of juice at someone who is trying to make the switch can always be a daunting thing to comprehend. I would definitely recommend the Joyetech Exceed D19 Starter Kit as a great place to start your vaping journey. And also for those wanting to make the switch from smoking analogues, this would be a stellar place to begin. For the price, I think you really do get a solid piece of kit that will keep on performing over time. I hope this has helped you on your quest for starter kit. Please make sure to leave any questions or comments below, we always enjoy hearing from you.